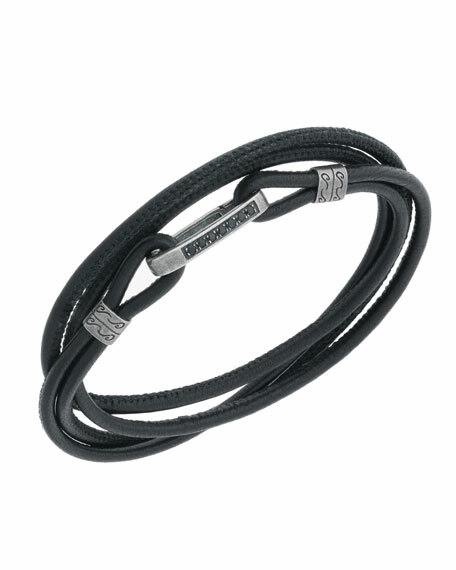 Men's wrap bracelet by Marco Dal Maso. Oxidized sterling silver and black leather. Wraparound style with thin bar station. Black diamond pavé linear detail. Life is full of experiences: some of them worse than others. But there will be no pain for a pure soul, only empowerment that will elevate us toward the sky. New Lash collection: leather and silver, body and soul. Handmade in Italy. For in-store inquiries, use sku #2643531.